May brought my brother and his family into our area, along with their three dogs. We had two corgis and a shepherd with us for about a week and now my daughter has her heart set on aquiring a corgi -- not sure how enthusiastic the guinea pig will be to adding a dog. This past spring I continued taking acrylic painting and watercolor classes at the Art League. I've posted many in progress photos on Instagram, and many of the paintings from this spring still need a bit of background work before I feel like they're finished. Two of my favorite paintings were of a cow skull and a vase of day lilies. I also completed, framed and delivered two commissioned pastel paintings. These were both made for a colleague of my husband who retired. This first painting is of Basin Harbour, Vermont where they've been holding an annual conference for years. And this is a scene from the Isle of Skye in Scotland from a recent staff ride. I attended the retirement party where these were presented. I now understand why actors don't like to watch their movies with others. It was easy enough to talk about my work at Artomatic among strangers, quite another thing to accept compliments from people I know. First, get their app -- Central Park. This was much more helpful than just using goole maps to find our way through the park. It has an interactive map with GPS, so you know exactly where you are. Everything's tagged with a pop-up for more information -- walks, points of interest and luckily bathrooms. There's even a guided audio tour. We took the subway to 81st street and entered the park close to the half-way point, by the Museum of Natural History. We strolled down the paths while the kids climbed all over the large rocks all over to make our way around the Great Lawn and by the Turtle Pond where lots of people were enjoying the lovely weather. We spent three hours walking to the south east end of the park, and we could have easily spent another three hours (especially since the kids saw the rides at the Victoria Gardens amusement park). But what I really wanted to make sure we saw were places that they used during the Angels Take Manhattan episode of Doctor Who. So, back on our walk just south of Belvedere Castle is the winding, overgrown Ramble area which leads to the Lake. At the center point is Bow Bridge, used by Matt Smith as he ran back through the park at the end of the episode to find the last page of the Melody Malone book he ripped out - and Amy's afterword. Once you cross the bridge it's back to lush green grass. Walking on the eastward path will lead you straight to the Bethesda Fountain and Terrace - and perhaps a few weeping angels. When Rory walked through here it was deserted, which is how he got zapped back to the 1930's by a cherub from the fountain. Right behind the fountain the terrace stretches under the road with a beautifully tiled ceiling and walls. Rory and the Doctor both walked thorugh here. If you walk up these stairs, they'll lead you to the Mall walk, with statues of poets and musicians on the side paths. And lots of "performance artists" all throughout - including one guy dressed as Batman riding a bike around. The Doctor sat on one of the benches to read Amy's afterword. Keep following the walk south and you will be pointed towards the Wollman Rink. Right next to the Dairy are two large hills of rocks. It'll be easy to spot the larger group where they filmed Amy, Rory and the Doctor sitting. You should be able to see this in the background. (I found this photo from TardisMusings. Click on the photo to be taken to that post with more info on US filming for Doctor Who). Of course, the building behind them is no longer under construction. Here's my kids posing on the rock. "Afterword, by Amelia Williams. Hello, old friend, and here we are. You and me, on the last page. By the time you read these words, Rory and I will be long gone, so know that we lived well, and were very happy. And, above all else, know that we will love you, always. Sometimes, I do worry about you though; I think, once we're gone, you won't be coming back here for a while, and you might be alone, which you should never be. Don't be alone, Doctor." Well, now that Typepad appears to be back to normal I can finally blog about our first "con." We took the kids to Awesome Con in downtown DC last weekend, having no idea what to expect. We bought tickets when we heard that Billie Piper (better known as Rose Tyler from Doctor Who) would be the headline star. She's the favorite companion for most of this family. After hemming and hawing and stressing about the prices we ended up picking up the VIP passes. I'm very grateful we did that as those who showed up on Saturday waited over two hours in line just to check in. We really used our passes and ended up attending all three days of the 'con. And we dressed up in costume as well. I got another use out of last fall's Halloween costumes! Friday we went to check in and check it out and walk through the exhibit hall. The kids got go through the kids' activities without a line, thankfully. 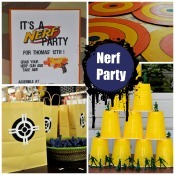 They shot nerf darts at Boba Fett, got balloon creatures made (a Pokemon and 10th Doctor), and begged us to buy them stuff. We saw lots of people in costume and quite a few Doctor Who related ones. The remote-control R2D2 was pretty cool. Saturday was our big day there, as the celebrities showed up for photos, autographs and panels. We saw Sean Astin's panel (of Goonies & Lord of the Rings fame) and really had a great time. He was funny and gladly answered fan questions on any of his movies. His favorite answer for taking a role seemed to be "kissing the girl" which got a great response from the audience. We got his autograph later in the day and he was very friendly. Our main quest was to get to Billie Piper's panel. With the VIP pass we were able to get in the room ahead of the general admission and Rachel quickly ran and grabbed seats next to the mike so she's be in prime position for the question line. I also sat in on Simon Fisher-Becker's panel. He plays Dorium Maldovar in Doctor Who (the guy with the blue head) and I have to say his was the most moving and inspiring talk I've heard. I just hope he decides to write his autobiography, and if so it'll be an amazing book. The family joined me after they'd waited in line to meet a woman who did a Pokemon voice. Can't remember her name, but they sure did and they were quite excited. Sunday we were back in the afternoon to get photo ops with both Billie Piper and Sean Astin. I was amazed as how fast they pushed people through, and Sean Astin was quite funny. As everyone was lined up he yells out "Are you ready for the best 6 second interaction of your life?" The kids and I have looked through some of stories on Awesome Con checking out everyone else's photos. I am a bit disappointed that the news articles seem to focus on just the superhero costumes. We saw some great ones from a whole Game of Thrones group to a drunk Sherlock & Watson, to lots & lots of Doctor Who. One person even had a remote control K-9. So here's a couple of the pictures we took of other Doctor Who costumes, including the best Weeping Angel costume I've seen. - the 11th Doctor carrying Tom Servo (from MST3K). In his bubble head the words "exterminate" wrapped around. We picked up this set of Doctor Who cookie cutters from WarpZone Prints back in the fall so we could make some cookies for our 50th Anniversary Doctor Who party. And I see they've added tons of new ones since I ordered -- including the doctors, K-9 and more. Well, we never got around to making the cookies. But a quick search of Pinterest gave me loads of recipes for salt dough, which is made of salt, flour and water primarily. That's important because once you use clay with a cookie cutter you can't use it with food ever again. Salt dough! We had a blast doing this. It's quite easy to mix and roll. I gave the kids each a large piece of parchment paper to use. We found with these cutters you really need to have the dough as thick as the cutter. If it's too thin then the detail areas just cut through the dough as well. Once you've cut out the dough, you just bake them in the oven on a cookie sheet. Let them cool and you're ready to decorate. I pulled out some leftover blue plates, my entire basket of craft paint and a few old brushes and let them go to town. I did go out and pick up a bottle of ice crystal Glamour Dust paint by DecoArt - which we used librally on the ornaments. It gave them a nice sparkle without being too much. The glitter paint was really cool on the white Adipose. After the paint dried we used a hot glue gun to glue a ribbon loop to the back of each ornament. I'll need to seal them before putting them away for the year (especially since the back sides aren't painted). My kids love Advent calendars. Chocolate filled ones and Lego-filled ones - the more the merrier. Why stop at just one? Or two? Or three? That's fine if you have the space to display them, but we really don't. Especially all those Lego pieces. This year I thought it'd be fun to put together a homemade one. A hanging one. I considered several different options: bags clipped to a canvas hung on the wall, bags taped to a wall or door, small bags hung from a small Christmas tree (I'd bought one just before Thanksgiving), or hung from a stick across a window. In the end I decided to hang them across our dining room window. I found a chunky stick in the backyard that was just the right length and used a couple of command removeable hooks to hang it across the window using twine. From the branch I tied pieces of twine - all different lengths. I had two bags of small clothespins that I used to hang my bags. I found that the twine fit through the hole in the metal clip part, so I tied all the clothespins to the twine. Now for the bags. I used two different sizes of glassine bags I found at Michaels. Each bag was filled with two treats (two kids = two treats) and taped shut with a piece of washi tape. For the numbers I used Kara Dudley's Everyday Life Number Circles. These cut beautifully. I could have just glued the numbers to the bags, but I wanted to hide the treats inside a bit. So I backed the numbers with a mixture of punched circles, Martha Stewart doilies, red reindeer and doilies cut with my Silhouette. It was a nice suprise for my children this morning, who didn't realize it was December 1st. A quick picture from the Halloween Bingo on Friday at my kids' elementary school. They loved how their costumes turned out. But pulling the fake sideburns off, not so much. Rachel actually let me put braids in her hair, although they were limited to the sides. She still doesn't believe me when I tell her that yes, I do know how to french braid. A far cry from 7 year ago, just starting kindergarten. When this one was three, and definitely not happy that she couldn't get on the bus with her brother. That face just says it all, really. Well, not Congress, per se but the building. It'd be years since I'd done a tour. We had three cars full of Boy Scouts and a nice Saturday afternoon. These days you enter underground through the new visitor's entrance and get a 15 minute presentation on the history of Congress and the building. There's a giant copy of the statue "Freedom" from the top of the dome. And statues of famous Americans and presidents donated by the states. The dome is certainly impressive, as is the old Senate room with the "whispering effect." Just wished they'd let you peek into the actual rooms like you used to be able to. We chose not to bring the Nikon, and I'm regretting that decision. An iphone is more convenient, but wouldn't these have looked nicer if taken with a DSLR? Rachel wanted to have a scavenger hunt at her party. We made a list of 40 items and then found pictures to match. I used Photoshop to add numbers, and sometimes quotes. Then Thomas hid them all over the yard. Want to use my list? You can download it here. 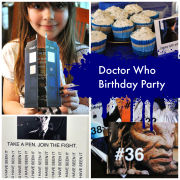 We decided to carry our Doctor Who theme to the food for Rachel's party. World Market provided us with Jammie Dodgers and ladyfingers -- a stand-in for fish sticks. The one thing that was missing was jelly babies - someone had bought all the packs the week prior and the candy store didn't get any more in stock by the party. We had descriptive signs and some who-phenilia courtesy of Hot Topic. Thomas decided to arrange all the mini figures into scenes from the show, complete with a hand-written description. The custard was homemade; the fishsticks were ladyfingers. I used this basic vanilla custard recipe from food.com. And I insisted on having cakes with edible ball bearings. We made the TARDIS cake (and it looks homemade), but Rachel was thrilled and that's all that matters. Wilton has some spray color for icing -- if you use a thick coat of the blue you'll get this color.